Deviant gait carried your humble narrator forth from the hillocks of raven eyed Astoria, and I had arrived at an atavist pavement known only as “Railroad Avenue” in the Blissville section of Queens, a forgotten road which runs alongside that lumbering cataract of unintended consequence known as the Newtown Creek. My goal was to accept an invitation to tour the Sims Metal Management facility which might be found at its terminus. An industrial lane, Railroad Avenue is well named. Ancient track beds, dating back to the American Civil War, spread squamously across the land. 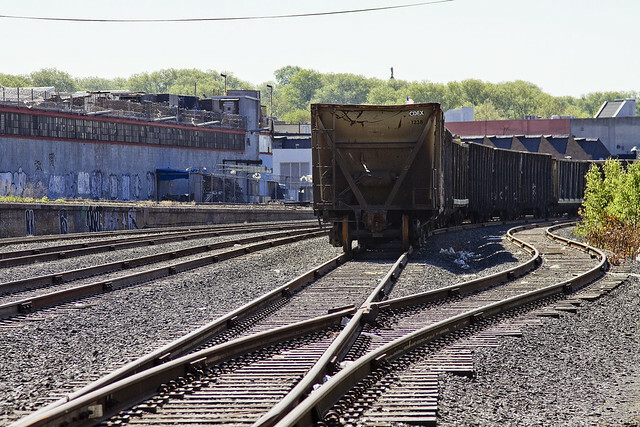 Long ago, passenger service along these tracks created an indelibly unfavorable opinion of Long Island City, as locomotive travel moved past manure depots, rendering plants, acid factories, pickling houses, and yeast distilleries. Today, it is mostly freight, although just a few passenger trains still travel between Hunters Point and Jamaica along these rights of way. 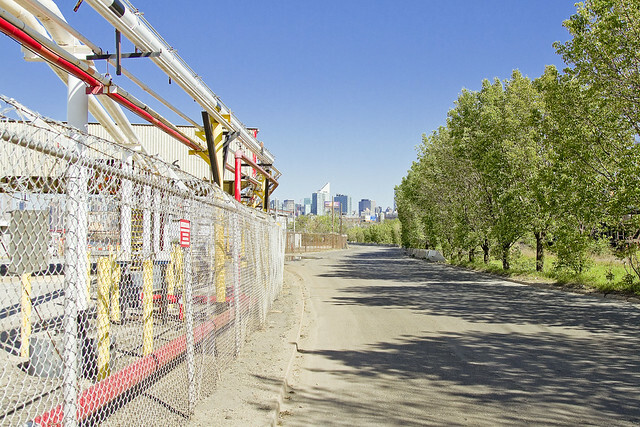 Petroleum industry infrastructure dominates the first section of Railroad Avenue, and upon reaching its terminus, one realizes that he has arrived at the Sims Metal Management Queens Terminal. 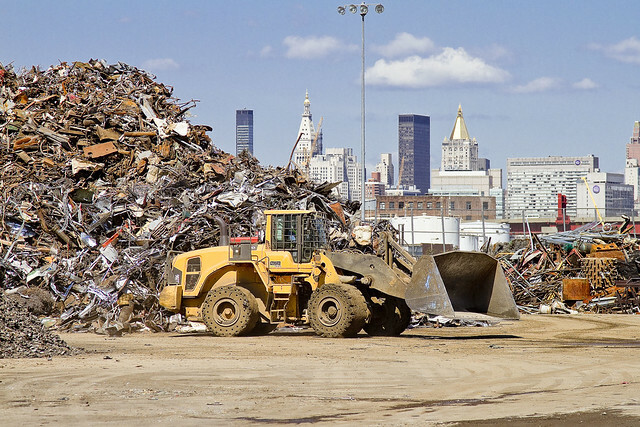 A waste transfer station, Sims receives municipal recycling materials from DSNY, and is also a large and enthusiastic global player in the metal recycling business. 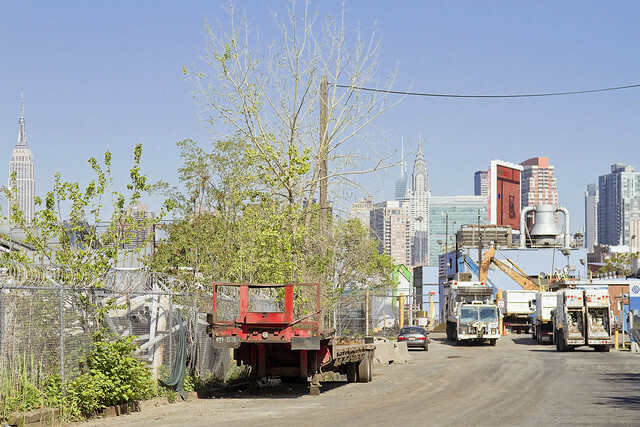 Like many other industrial sites found along the Newtown Creek, Sims is off limits to the public. There is very good reason for this, as there are enormous machines which dwarf tractor trailer rigs whizzing about, and literally tons and tons of material being sorted and processed. Your humble narrator was asked to arrive with steel toe boots and appropriate clothing. Upon arriving- I was outfitted with hard hat, safety vest and glasses, and instructed by the site supervisor in the mores and habits observed by the corporation and its employees. 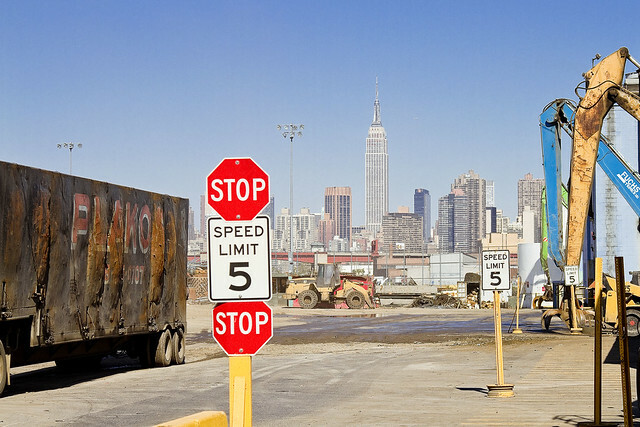 Procedurally speaking, Sims welcomes private and public (DSNY) recyclable material, within certain guidelines. 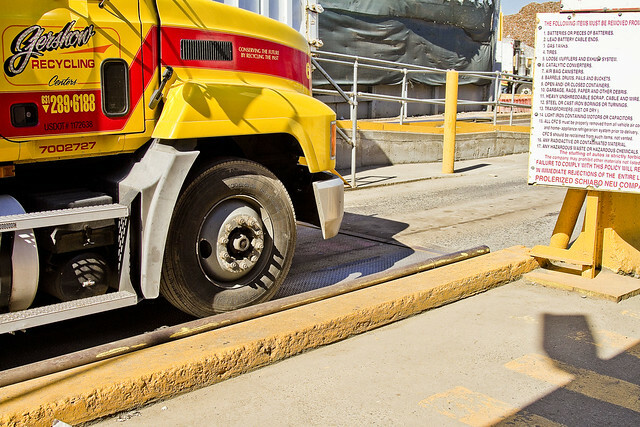 Trucks carrying said material are weighed on an enormous scale at the gate, and the attendant creates a manifest describing what is being delivered and dispatches the vehicle to an appropriate spot to tilt and discharge its cargo. Said cargo can be anything from copper and aluminum to iron girders or automobiles. The equipment at work here is an order of magnitude larger than what I normally witness at construction sites around the city, the rear tires on the earth mover pictured above- for instance- were 3-4 feet in diameter and seemed to be made of solid rubber or composite. Later in the day, I saw a tire change occurring on another unit, which required the presence of a specialized machine to remove tire from its axle. 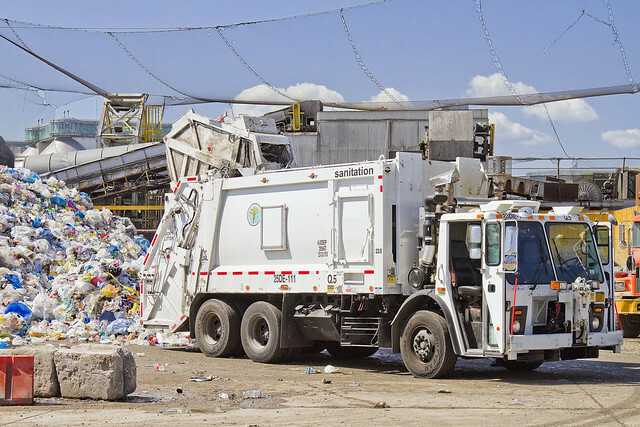 Of particular interest were the series of white packer trucks arriving and tilting here, carrying the Department of Sanitation’s curbside recycling pickups. 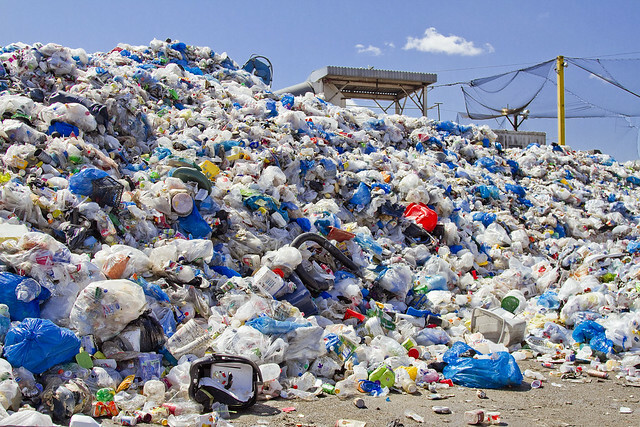 Sims enjoys a municipal contract with the City to handle this task, and manage the velocity of such materials back into the plastics and glass ecosystem. A variety of raw materials can be derived from the plastic in soda bottles, for instance, including spinning the synthetic fibers woven into “fleece” sweatshirts and sneakers. 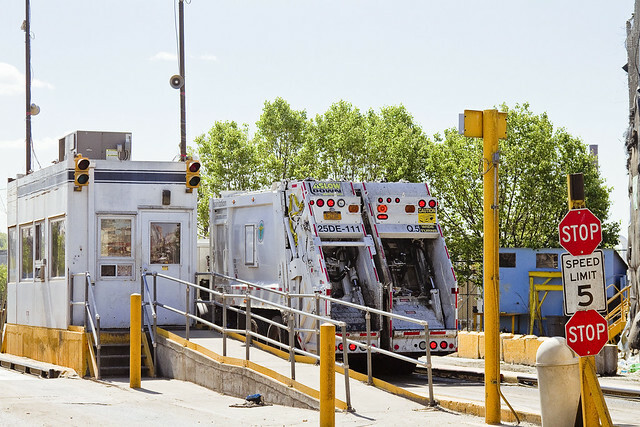 Like every other truck entering and leaving the yard, the DSNY trucks are weighed and presented with a receipt for their drop off, for which Sims will later bill the City in accordance with their contract. It is my understanding that said remittance is built around gross tonnage of materials rather than by individual truckload. A staggering amount of these recyclables was extant on the day of my visit, but this is just one tuesday morning’s worth of material, and isn’t it even close to the final 24 hour tally. The mound visible in the shot above was likely 20 feet high, and receded back from my vantage 20-40 feet. Tomorrow, we go deeper into the operation and find out where to get all heavy metal on the Newtown Creek. Garbage in…garbage out. Reminds me of what it must have been like on Old West cattle drives. How come you just had steel-toed boots lying about? I didn’t, but given how much time around industry and harbor I seem to spend these days, made sense to get a pair. Went to a shoe store – “Shoe Place Eternity” on Steinway between 34 and Bway. Got a nice pair of “Caterpillar brand” steel toes which are surprisingly comfortable, oil resistant, non slip, not too bad looking for $70. Not bad.